Peter H. Sellers. On the theory and computation of evolutionary distances. Peter’s early work in sequence comparison is probably best encapsulated in three papers that take a mathematically rigorous approach to sequence alignment. 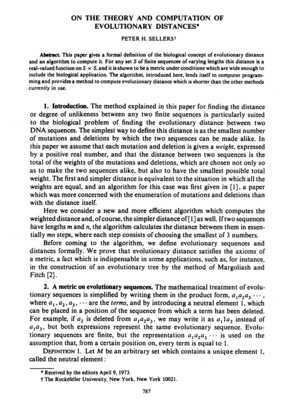 In the first, published in the SIAM Journal on Applied Mathematics in 1974, he defines a distance measure between sequences, which he proves to be a metric, and he also describes and proves valid an algorithm for calculating it. This is, basically, what is today commonly known as the Needleman-Wunsch algorithm, although a careful reading of Saul B. Needleman and Christian D. Wunsch’s paper shows that they, in fact, describe a different algorithm. It is really Sellers’ algorithm or a related one by David Sankoff, that is currently used.